Source: Census. Chart by BikePortland. As Portlanders puzzle over why local bike, bus and rail transportation has stopped rising, last week’s Census figures show another trend continuing to reshape the city’s population. New construction in the central city hasn’t come close to relieving one of the country’s harshest rental housing shortages. For structures built before 1940 — the bungalows and walk-ups built before the age of automotive planning that cover most of the land between the Willamette River, 82nd Avenue, Powell and Lombard, including many of the most bike-friendly neighborhoods in North America — median rents rose 19 percent in the two years from 2011 to 2013, Census estimates show. Since 2005, when the City of Portland’s population growth began to dramatically outpace its supply of new units, rent in these central-city buildings has risen 47 percent. “In Irvington, I can pretty much stick a sign in the yard and have it rented within a couple days,” said Shea McGrath, a broker with Carefree Property Management, in an interview Tuesday. 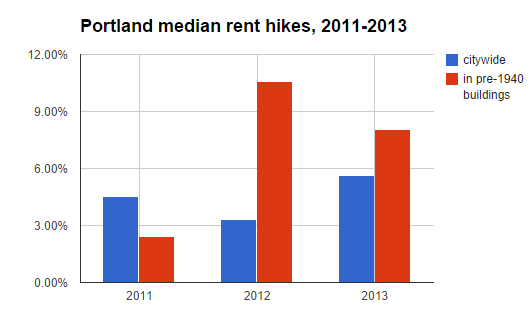 Citywide, median rents rose 9 percent from 2011 to 2013 and 37 percent since 2005. Nationwide, median rents are up 4 percent since 2011 and 24 percent since 2005. “In terms of the Portland rental market, I don’t really see anywhere the rents are not increasing,” said Nicholas Cook, owner of Sleep Sound Property Management. 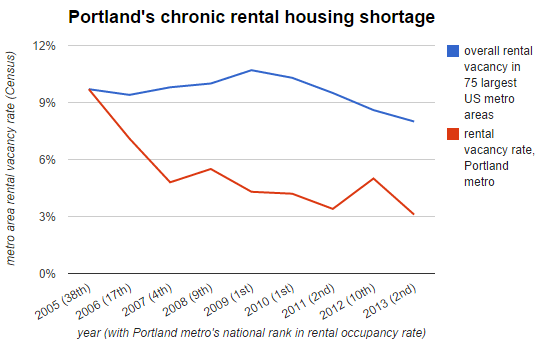 There’s little sign that Portland’s rental housing shortage is easing. The metro area’s rental vacancy rate was just 3.1 percent in 2013, its lowest in at least a decade and the second-lowest in the country after San Jose’s. In fact, the Portland area’s rental vacancy rate in 2013 was the fourth-lowest recorded for any of the country’s top 75 metro areas in any year since 2005, when the Census began tracking the figure. Though people who spend time in central Portland sometimes speak as if the city is in the midst of total transformation, Census figures show the smattering of new four-story apartments on Division, Williams and elsewhere are basically a drop in the housing bucket. The city’s supply of housing units grew by just 1.6 percent in 2011, 2012 and 2013 combined, according to the Census American Community Survey. The estimated number of households in the city, meanwhile, grew twice as fast. To the extent that these estimates are accurate, that means that if about 4,000 net new households joined Portland in those years, about 2,000 either shacked up with another household or were priced out entirely by rising home costs. Tens of thousands of other households, of course, simply swallowed the big rent hikes; others moved to neighborhoods they might have avoided a few years before. 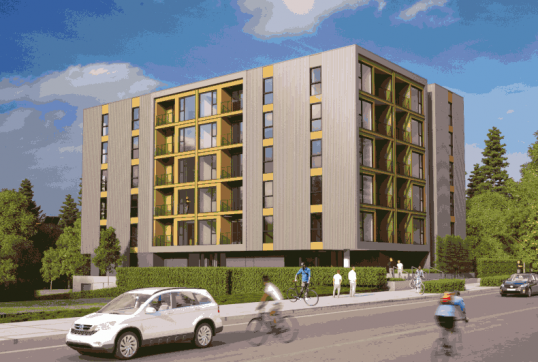 After neighbors protested early plans for Overlook Park Apartments, the developer added on-site auto and bike parking spaces and redesigned the building to target higher-income tenants. Demolitions of old houses aren’t to blame for the rent increase among those that remain: the Census’ estimate for the number of occupied units in pre-1940 structures actually rose slightly from 2011 to 2013, meaning the number of demolitions was statistically negligible. There’s also little chance it’s just a data fluke. The two-year rent increase among old buildings is far beyond the Census’ margin of error. Instead, tenants and housing experts said vacancies are low and rents soaring for all units in neighborhoods close to the region’s two main job centers: downtown Portland and central Washington County. “People want to live in those kinds of neighborhoods,” said Jason Miner, executive director of the anti-sprawl nonprofit 1000 Friends of Oregon. In 2005, Portland’s rental vacancy rate was about 9.7 percent, exactly the same as the national rate and in the middle of the pack for U.S. cities. But over the next few years (years that also, for whatever reason, saw a huge surge in local bicycling) people began pouring into the Portland’s area’s rental housing, driving the metro area’s vacancy rate to the lowest in the country in 2009 and 2010. It’s hovered in the top ranks since, as development has failed to keep up with people’s rising desire to live in Portland. In response, landlords have apparently seen little reason not to continue raising their prices at about twice the national rate, even faster in walkable, bikeable, transit-rich areas that were originally built without cars in mind. As rental prices in inner Portland neighborhoods have risen, people who can’t afford it are forced further and further away from their jobs. Once that distance goes beyond the 2-4 mile sweet spot for bicycling, other modes — like driving and transit — start to become more competitive. The City of Portland, meanwhile, is in the midst of a public comment period for its 20-year comprehensive plan, with many Portlanders urging the city to prevent new development during this process and the zoning and parking reforms that are scheduled to follow. The first of four public hearings on the comprehensive plan is tonight. You can also comment by emailing psc@portlandoregon.gov with “PSC Comprehensive Plan Testimony” in the subject line. — The Real Estate Beat is a regular column. You can sign up to get an email of Real Estate Beat posts (and nothing else) here, or read past installments here. This sponsorship has opened up and we’re looking for our next partner. If interested, please call Jonathan at (503) 706-8804. Expecting median income-affordable real estate within “2-4 miles” is unrealistic in a city that has been successful in attracting hordes of new residents from all over the country. That ship has long since sailed. However, there are several neighborhoods just beyond that that are still affordable for median earners to rent/buy. Montavilla, Madison South, Fo-Po, Cully, and Parkrose are good examples. These are areas that are bike-able to downtown. There’s lots of room to build more Portland within 2 to 4 miles of the city center. We’re just not doing it. And what do similar maps in the US look like? Michael – “we’re just not doing it” -is it just the numbers? I see new multi-unit dwellings going up all over the place in No-Po. At least 8 new multi-story buildings. Are those all condos? Does your reporting take into consideration new rental properties currently being developed? I’d be interested in seeing what the numbers look like in 5 *more* years, since the traditional argument is that market forces will correct this situation. The problem with the new rental properties being developed, is the rent is too high. There is not a single new apartment complex being developed in Portland where the rent for a 300 – 400 foot STUDIO is under $1,100. Typically, a new studio is around $1,200. I know, because I have been looking to move. How a cyclist can afford this is beyond me. If you want density and “sustainability” in your neighborhood locale here in Portland, you are going to pay through the nose for it. NW Portland has lots of very nice early 20th century apartments with studios / one bedrooms of that size, in that price range. The inner east side has lots of ~1970s studios / one bedrooms available in that price. (Unfortunately however the 1970s weren’t an aesthetic high point in Portland multifamily housing). Over time, the buildings being built right now will age, and be less able to command premium rents. They’re the affordable housing—in the non subsidized sense of the term—of the future. Until that happens, they’re reducing the demand on the older properties mentioned above. to do that, one would have to bulldoze irvington, laurelhurts, the central eastside industrial district, etc. Out of curiosity, Todd, can you list for me some Portland areas that are not bike-able to downtown? Anything beyond a 6-mile bike ride from downtown is probably out of the average person’s ability to cycle every day. Time spent commuting is a major obstacle, most people don’t want to spend over 30 minutes on a commute. I ride a bit over seven miles each way and it’s actually a shorter commute than my last one. But I was already a committed cyclist. And I don’t own a car. And I don’t work downtown, so the bus would take too damn long! I pass through #144 every day, and they’re going to be sad to see how few the numbers actually are….even on a sunny day. For the majority of people, I’m going to venture that any place east of 39th is going to be too far to consistently bike commute to downtown. I disagree. Anecdotally, bike mode share at the company I work at downtown is quite high for people in the eastside 60’s and 70’s. I’m in the 60’s and my commute is only 4.5 miles, which is really quite doable for any reasonably fit adult. Based on the complaints I hear, the Hawthorne Bridge and its approaches seem to turn more people living in the E 60’s and 70’s off of cycling to our office (in southern-central downtown) than distance. Living just east of 60th I agree as well. I can get into NW by legacy in less than a half hour. What is the overall percentage of bike commuters? I’m not saying that it’s impossible for some (I bike downtown myself from pretty far south and 75th), just saying that over 30 minutes of riding is likely too much (even in nice weather) for a majority of population currently. In North Tabor, last census the bike commute rate was just over 11%, but when you go just one mile east to Montavilla it dropped to 4.5% I believe. Sorry I meant at both your workplaces. Not sure. I think that aside from the Bike Commute Challenge it’s in the 10-20% range. We have a lot of inner-inner eastside bike commuters. The connections to downtown from Parkrose are just plain awful. Rocky Butte and the freeways are big barriers. That’s why we got to build the I-205 underpass project! >Expecting median income-affordable real estate within “2-4 miles” is unrealistic in a city that has been successful in attracting hordes of new residents from all over the country. That ship has long since sailed. The ship has sailed because NIMBY portlanders are blocking construction of new multi-unit buildings in areas that historically allowed construction of multi-unit housing. There are plenty of lots available for high-density development that aren’t plop in the middle of established single-family neighborhoods. How many empty surface lots are there downtown? How many throwaway strip malls and fast food joints on NE Broadway/Weidler, MLK, or Powell that could be denser mixed commercial/residential? That’s the kind of development that needs to be a focus, not cramming four shotgun rowhouses onto a 6000sqft lot in Eastmoreland. You have just described the Pearl District and South Waterfront, two very successful high density mixed use districts. The problem is, of course, to add the projected 750,000 additional residents, we would need ~100+ additional Pearl Districts. I think he is saying that there are market forces in place that we’re just not likely to get past. If new people have the money they can live wherever they want. Life isn’t fair, you can’t always get what you want. I’d love to live in Alameda or Irvington but I can’t afford a house there, so I don’t. The world hasn’t ended, no one is ‘owed’ a place to live within two miles of the city center. I think your comment represents NIMBY-ism at its finest. if you owned a home would you want a huge 80 unit apartment complex going in across the street or in your back yard? Yes, 211 to be exact. I’m going to guess you are a in a very small minority then. Pros: More local stores within walking distance, removal of an eyesore lot that served no legitimate purpose, safer main street with much more pedestrian traffic. Cons: A little less light on the back yard in the morning. That’s an easy choice without even considering the benefits created for people who will live and work in the new development. I wouldn’t be happy to see that myself, but on the other hand, it would mean that I have the option of selling my lot to a condo developer for an outrageous sum, so I suppose you could argue that I wouldn’t be losing anything. That’s a red herring, because it isn’t happening anywhere in Portland, with the exception of a few single-family houses that share a backyard with commercial and high density residential zoned lots along major streets like Hawthorne and Division. Dave’s concern, and the concern for most NIMBY SFH owners, are “McMansions” and “Row Houses” going up in their neighborhood. These create a marginal increase in neighborhood populations, but spread out over the city, would allow us to add thousands of new houses. If they create only a marginal increase in neighborhood population, they probably aren’t much of a solution though, are they? Big houses on smallish lots don’t increase density much (though they probably will if they become rentals in 50 years, a la Sellwood and Boise) but row houses could increase citywide density quite a lot. I’d like to cover the row house situation locally if I can find a good angle on it. row houses in many neighborhood are not necessarily the answer though. There are plenty of places which will face parking issues and some that will struggle with access to transportation and other amenities. Building housing density in areas that don’t have sufficient amenities to handle it (i.e. much of east Portland) is irresponsible. Therefore I don’t think just scattering these types of development throughout the city is a great solution. On the other hand, Dave, there are plenty of areas of inner Eastside Portland that could easily handle more population without even the minimal (by big-city standards) parking pressure that areas near, for example, Hawthorne and Division are facing. Pretty much everywhere that’s more than a block or two from the major dense-ish commercial streets (Hawthorne, Division, Belmont, Burnside, etc. ), has paved streets and sidewalks, and is close to bikeways or frequent service bus lines would be good in my opinion. I think that’s the majority of the land area in inner/mid N, NE, and SE Portland. The majority of that suitable-for-more-density area is currently zoned R5, prohibiting row houses or even skinny houses. NE 57th between Burnside and Glisan. There is a redevelopment going on that include multiple skinny houses. In the two lots south of Everret they are building another two skinny houses, next to the two already there. If these would have all been townhouse developments we could have had two more houses in there instead of all that dead space in between for a small walkway that can grow very little. North of Everett, we still have two empty lots where the summer demolitions were. Again, they are planning on four single family skinny homes where if they could think creatively with property lines, we could get five or six townhouses. Same lots, 50% higher density still with small back and front yards…just not that ten foot dead space in between each one. Fair points Alex. Sounds fine to me. I disagreed more with the idea that we should just sprinkle density around town. What street outside of downtown doesn’t border or contain single family homes? What area outside of downtown has the infrastructure (commecial, transit, etc.) to be able to handle a high percentage of no car households? increased density forces people to use other modes. it’s a win-win, imo. that’s assuming that people will choose to live in these types of dwellings if they know that they have to change modes. Throw some “no car” clauses into many apartments and see how excited people are about it. I think you answer your own point. Is not building anywhere (including in suburbs) a viable option? If not the question isn’t what’s perfect, but what’s best available. Whatever inner Portland’s infrastructure needs might be, I’ll bet a beer they’re a lot less than the infrastructure needed to put equivalent housing units on a green field. actually, no, that’s not the reason, and which exactly are these areas that “historically” allowed multi-unit housing and no longer magically do? and what is multi-unit? 2 houses in a lot? builders won’t build until they know there is profit to make and demand for the product. There’s really little more to it. I believe he’s referring to the Buckman Neighborhood, and a lot of Sunnyside as well. Look at all the 1960s Joe Weston (American Property Management) apartments in there. At that time the whole area was zoned for apartments. In reaction, it was mostly zoned single family, I believe, with the 1980 Comprehensive Plan. The poors can live on arterial corridors while the neighborhoods of “real citizens” are downzoned into homogeneous and exclusive enclaves of wealth. now you just sound bitter and a little jealous. In general, household sizes are falling in Portland as they are almost everywhere in the developed world due to the aging population, smaller families and delayed marriages. It’s pretty hard to spot changes in the rate of household formation at the local level amid all that. Related note: a “household” is defined by the Census as whoever you share food with. Three roommates sharing one “single-family” house probably count as three households in these stats. Michael, it looks like the population increases in PDX has a lot to do with births. PPS forecasts that they will have 13,000 new students in the coming years. This means that current zoning (for studios) may be out of touch with what certain Portlanders in the 20-45 year old range are up to…. I agree! I hope to tackle the 2-to-3-bedroom-apartment shortage in a future REB post. Though I don’t know of any zoning that actually specifically requires or incentivizes studios, except maybe the “group housing” loophole that’s being used for microapartments. Yeah, I think it’s a matter of economics not zoning. In the new apartment building in my neighborhood annual rents on studios are $34 per sq vs $27 per sq for two bedroom units. If you can get your building built and sold into this current rental demand it is almost negligent to build anything but studios or micro units. I don’t understand exactly why it’s this way, but it seems like there are hardly any 2 or 3 flats in Portland. Buildings designed as such (as opposed to a divided up single family home) tend to have larger units with multiple bedrooms and more living space. In other cities those would dominate secondary streets adjacent to corridors, where they also acted as a buffer to the higher intensity commercial areas. Not so in Portland. The vast majority of the land in Portland is zoned as single dwelling residential. In an area zoned R5, for example, duplexes are only allowed on corner lots, and on lots directly abutting a commercial zone. Otherwise they’re prohibited. Triplexes aren’t allowed at all. Additionally, residential buildings with 3 or more units are reviewed under the commercial building code, rather than the residential building code. The commercial code has much more involved rules about fire / life safety, including requiring sprinklers (which Oregon doesn’t require in most single family homes). It’s not a probably not a huge cost difference per square foot between building a duplex and triplex, but it’s possible that it matters at the margins. That said, the Ankeny Lofts project by Colab Architecture is a nice example of what I think you’re talking about. They managed to get 4 units (2 duplexes) on a lot that’s only 24′ wide, which is less than half the width of a typical Portland lot. Last time I cycled past it looked the second phase of this project was under construction. I realize you hate planners and everything the City of Portland does, but would care to explain where in the zoning code there is zoning for studios? What about the thousands of single people living with roommates in single-family houses around the city? With a sub 2% vacancy rate for apartments, can you really make the argument that the city has too many “studios”? Huh? So we built more pre-1940 houses that we demolished in the last couple years? How is that possible? It’s not. Just a sign of (a) noise in the sample or (b) changes in the number of unoccupied old structures. I’ll rephrase to clarify: “the number of occupied housing units in pre-1940 structures.” Good catch. I don’t think anyone would argue that our society in general as well as individuals values money over human rights. Welcome to capitalism! The alternative seems to be some form of communism, however, which hasn’t ever really worked that well. Apparently you’ve never been to Sweden. Nordic Model is a thing. I wasn’t aware that the Nordic Model includes the absence of a private housing market. I see that I wrote exactly the opposite of what I intended. I meant to say something along the lines of: “I don’t think anyone could plausibly deny that our society values money over human rights.” Whoops. Supply and demand has been around for at least thousands of years. I just wish everyone would find another “It Girl” city. Portland’s like the puppy Lenny “loved” to death. I suppose your family goes back ten generations in Oregon? Nope. Several generations, but that’s not my point. I know folks who moved here in 2005 who are also feeling the pinch. Places can get too crowded and be changed for the worse. Ask Venice. Or Austin. Or me. 🙂 You may have left wherever you did for Portland for that very reason. Who benefits from population growth, an influx of residents? Developers, landlords, but not very many other groups that I can think of. Cities always think it is a win for their coffers, but in fact it all too often is a net loss, as the demand for services outstrips the funds taken in. Then there’s that pesky thing called carrying capacity, which we in Oregon are fortunately not particularly close to overshooting, but at the planetary scale we’ve long since overshot it, and are soon going to discover just how much thanks in no small part to climate refugees who are expected to discover what a groovy corner of the world this here is, I mean was. Avoiding the tough issues is not a recipe for happiness. And shouting NIMBY! as a way to make the conversation stop isn’t helpful either. Look at all of the surface parking lots downtown. The City should start taxing them to give the owners some motivation to develop those properties. They actually do pay property taxes, but only on the value of the land. However because assessed values in Oregon are disconnected to real market values there is less of an incentive to develop the land than there would be otherwise. It makes sense to hold on to a lot and wait for its value to appreciate further. Take this parking lot for example (http://www.portlandmaps.com/detail.cfm?action=Assessor&&propertyid=R246598&state_id=1N1E33DD%20%202200&address_id=101210&intersection_id=&dynamic_point=0&place=1110%20SW%20WASHINGTON%20ST&city=PORTLAND&neighborhood=PORTLAND%20DOWNTOWN&seg_id=138257&x=7642696.55&y=683782.961). Back in 1997 the land was valued at $378,000, and assessed at $368,730. Today the land is worth $1,391,770, but they’re only paying taxes on an assessed value of $591,610. I’d like to get myself calibrated. What does this group consider to be “affordable for median income households”? Is it total housing cost = 30% x median household income $59K / 12 = $1,450/mo, so maybe $1,300 for rent, after deducting $150/ mo utilities, for a family to rent a 2 bedroom? Is that the rent that we’re looking for in the central city? 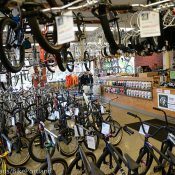 Let’s face it, Portland’s a boom town right now and the bicycle scene, stagnant as it is, is part of the problem. Thanks for the link. I think we’re already seeing climate refugees. I also think there will be way more than projected, at present. Do things like AirBnB take potential long-term rentals out of the market because homeowners can easily make more from them as short-term rentals? I think in other cities that’s proven to be the case. However, in Portland I’m not sure that will be true. You might rent a house for $2000 long-term, but it’s hard to get more than maybe $150/night on Air B’nB’. That means you have to rent it out about 160 nights/year to make the same money you would renting. Given you can probably rent it non-stop in June/July/August, can you rent it 70 nights in September-May? Not a slam dunk from my point of view. Also, you have to consider all the cleaning / property management, which adds time/cost. Thank you for doing the math on this. As a business proposition, converting a long term rental to a short term rental is, normally, a lousy idea. Owners make more per night, but costs and hassle is also much higher. There is big difference between being a landlord who gets a steady income throughout the year for not much work, and a host who has to be there every couple of days to change sheets, hand over keys, and scrub toilets. If you hire a company to do the dirty work, it cuts into the price premium, and you have to fill even more nights to make money, and furnish your unit. I’m sure it makes sense at a certain point, if you could fill the space 200+ nights a year. Airbnb reports that their average Portland host rents out their space only 86 days a year, for $6,800. You make a lot more than that in Portland from a steady monthly rent, even if you build in a vacancy rate between tenants. However, I can see how conversion would be more appealing in at least two situations: where a landlord is locked into a way-below-market rent (rent control in NYC), or is terrified that a bad tenant will stop paying and refuse to move out because of over-the-top tenant protections like in SF. In those situations, the owners are balancing risk/reward. I live in Hillsboro, 9 miles from my job in Beaverton, I have a 0.8 mile walk or bike ride to MAX. I usually ride to the train stop and that is my morning commute. Then at night I ride the 9 miles home. Lately I have been riding my bike both ways as daylight starts to wane. This to me is the ultimate transportation. I live out on the edge of the urban growth boundary, I paid a pretty sweet price for a lot more house than inner PDX would have given me and I get to go to work and not use my car. I think I qualify as one of the success stories that regional planners are hoping for. Orenco is 1 mile from my house, and access to 26 is about 2 miles. I don’t believe that the bike is the only answer. I am a truly multi-modal transportation user. Since we moved in in February, I have driven to work once to make a trip East after. I know there are many anti-MAX/Transit sentiments on this site, but I find it very convenient for my needs. Throw Nike traffic into part of my route and a bike ride takes 35-40 minutes, while MAX takes about 25-30. Driving takes some of my co-workers 35+ minutes to go the same distance. While I don’t have a desire to live inside of inner PDX, all I can say is that for a very short increase in distance, we have a lot lower mortgage for the given size house we have. Rents are way lower out our way too, and with all the new units being tossed up around Orenco area, I can see in a couple more years things getting a bit pricier, but as others have already stated, this is a supply and demand situation. We’ve got a lot of employment in the area and a lot of people who want to live close to work, amenities and transit options. I am all about Bike-MAX-Bike. My neighborhood is smack dab in between the 60th street MAX and Mount Tabor park yet we have poor bike/ped access to either spot. There are at least sidewalks….even if they are sub-standard and with gaps in just about every direction, but having all three east side MAX lines here opens a whole world up to the “Interested but concerned” once we gain safe bike access. Selfishly, If anyone needs a nice one bedroom upper flat in a bike-able neighborhood…I happen to have an empty one we need to rent…comment and I will get it and get back to you. On the main subject, every property in the city zoning R5 or higher should be allowed to not only duplex, but have an ADU as well. All R5 or higher should be allowed one “granny flat” of less than 60% of the square footage of the primary home AND an ADU. Allowing for garage conversion/rebuilds including second story studies above these decrepit garages…wherever they lay on the property lines…..would instantly open up 10,000’s of derelict structures to be torn down and replaced with housing with very little impact on neighborhood character. You could then Cooperatively own the property in kind without sub-dividing. Hence both the primary home owner, and the “Garage ADU” occupant could gain equity long term. We need to think creatively if we are going to add housing without completely demolishing all of our current housing. We can do both…save the character of our “lower density” neighborhoods AND increase density in a sustainable manner….as long as we do not use the typical “everything is disposable” American attitude. Trashing whole blocks of old housing in favor of multiplexes just for the sake of density is not sustainable, nor politically palatable…we need to be creative. This is a great and fascinating subject. And enjoy reading everyone’s angle on it. Thanks Michael. 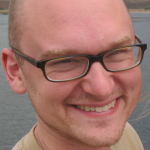 Seems like there has been very little discussion of employment on this thread (granted it’s about housing). To me employment is one of the keys. The city needs to make more employment centers in Portland (I think they are trying to start doing this with proposed chances to the Comp. plan). Relying on most employment in downtown and Washington County, is not going to spread the density around the city, it’s just going to created the bullseye, decreasing price -type housing marking we currently have. Rather than just building more closer to our current main job center, we can shorten people’s commute by moving their jobs closer to more affordable places that they want to live. Moving their jobs (?) sounds improbable. Boeing ain’t going nowhere, neither is Laikka or Nike or Intel or all the hospitals. Nor is Freddies (a large employer) or BCBSO etc. What employers did you have in mind and why would they move? None specifically in mind, but likely smaller businesses, (probably some of them completely new or new to the area). I’m not expecting huge corporations to eat up acres of land in various parts of the cities. I’d like to see more offices and smaller companies setting up shop around Gateway and other areas along 82nd or deeper in East Portland. I think the new Comp. plan is trying to promote some of this more mixed use, which I know you’re not a fan of. Yeah, regarding the problem that Portland planners are trying to solve about how to get people to work (and other destinations, but largely to their jobs) with less dependence on cars, the solutions they’ve pushed so far seem to be (1) transpo modes (rail, bus, sorta/kinda bikes) and (2) inner city housing density. But, as you say, another approach is to move jobs closer existing residential stock. That approach fits well with “urban centers” and “20 minute neighborhoods,” and it can work in conjunction with the others. The Lloyd district is, in some ways, such a move but it combines some good things (lots of housing along with biz development) with not really being outside the existing inner city, thus limiting its effect on moving jobs toward residences and spreading the costs and benefits over a limited range both geographically and demographically. Imagine if places like Gateway or Milwaukie had a core district the size of Lloyd district developed with 5 to 10 story, mixed-use, urban buildings, and other nodes around the city had a block or three of 3 or 4 story mixed use. Many more neighborhoods would be within easy walk or bike of an urban center with jobs, services, commercial, retail, entertainment, etc. Those urban centers don’t need to replace the big, campus/plant type facilities which Oregon Mamacita mentions but they could offer auxiliary space that many of those companies end up using, they can offer more housing closer to those campuses, and they can support the additional services locally that non-inner city neighborhoods tend to drive for under current planning. For some theory, visualization and actual built environs of this sort, check our Rob and Leon Krier’s work. Sorry about that rogue moderation script, Alan. I’ve approved both comments for good measure, since they were slightly different. No worries, and both posts is probably overkill, but thanks, Michael! I’d like to see more “urban centers” thrown into the mix. The talk I’m getting from Portland these days is about densifying inner East side residency (everything from ADU to high-rise) and extending alternate transpo modes (trolley, LR, maybe/sorta bikes and e-bikes) to support the current downtown. Well, if the problem is getting residences close enough and commute times short enough to jobs to reduce car dependance, then putting biz/job infrastructure close to residences works at least as well as vice-versa. The Lloyd district is an example, but maybe not as good as it could be. While adding lots of residences (good), its job-base also draws heavily on residential areas which are already pretty close to downtown, not so good at moving jobs closer to residences. Instead, if the sort of density planned for Lloyd was done at, for example, Gateway and Lents, both the opportunity for density and the proximity of jobs to residences are greater. Even at a smaller scale–4 to 6 story vs. Lloyd’s 40 story–human-powered urban fabric and “20 minute neighborhoods” then become a reality. No, I don’t expect existing political conditions to support that. See Leon Krier’s work for visualized and built examples. This story is just another in a string of signs that are all telling me it’s time to leave the Portland area. I’m a 3rd gen Portland area resident and I’ll never afford to live in the close-in Portland neighborhoods where I enjoyed my youth carelessly riding and skateboarding around. I’m not willing to go so far into debt for 30 years to do so, even if it means a higher quality of life (walking, biking, and skateboarding around). It just does not make sense. We rented in Sellwood in the late 90’s and early 00’s when the cost of a fixer upper there was in the mid-$200K (and I thought that was a lot back then). Now people are paying $300K in Sellwood to tear down houses for new construction and new rentals are fetching $3 per sq foot (per month). I’d rather spend my $ on private school for my kid, or experiences that we can have as a family, than on a house closer to downtown Portland. For now it’s a 12 minute drive into downtown the one time a week I need to go there. Matt, please consider the areas south of Woodstock. It would be so nice to have you buy a house and maybe do some cosmetics. Lots of nice people moving in there. The neighbors are thrilled when you don’t tear the house down- brace for banana bread, plant starts, etc. In 2002 we left Sellwood and moved 2-3 miles south, near downtown Milwaukie because we couldn’t afford Sellwood on our ‘fresh-out-of college’ incomes. We’ve made the most of it here and have had a positive impact on the town through public engagement. As New Seasons and Grand Central move into Woodstock this next year, prices there will increase as well…. Then as light rail opens next fall, prices will continue to increase in Milwaukie (and Sellwood), eventually making it unaffordable to people who grew up here. Sorry if this sounds negative, but it is hard not to be when you see the place you’ve grow up in change so much that you can drive down a street like Division, and it does not resemble the place you remember at all from just a few years ago. When will folks realize that growth—in everything, but first and foremost in population—is not the panacea we’ve all been led to believe it would be. The tenor here on bikeportland, and pretty much everywhere else, is that growth is a given, something we need to anticipate, plan for, accommodate, even reward. But of course there are real costs to this approach, as many comments here suggest. Being priced out of your neighborhood is just one. My point is that we don’t always and forever have to take growth as given. We can recognize it for what it is and refuse to accommodate it, encourage it, reward it through our policies. Figure out what kind of place we would prefer and then figure out how to bring that about. Any takers? 9watts, I’m sympathetic to your point that growth isn’t necessarily good or inevitable but I don’t see how it makes sense to talk about population growth in particular as an issue we sould try to control at the local land-use planning level. Maybe you can help clarify this for me? (1) avoid the topic: It’s too big, too contentious, pointless, racist, etc. (2) problematize this dimension, elevate it to a level where it can be discussed, not because we hope to pull up the drawbridge and keep the goodies for ourselves, but because there is much we could learn, and problems we could solve more easily if we didn’t keep ignoring this issue. 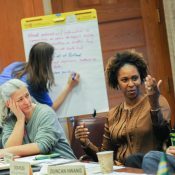 Because we are unlikely to succeed at addressing population growth at the local land use planning level, we need to broaden the discussion, find the best level of aggregation at which to address is, work toward policies that make it possible for local land use actions to complement this larger effort. Right now we reward fecundity, subsidize growth, incentivize in-migration, etc. We could stop all of these things without falling into any of the traps set by those who would rather not think about these tough issues, or are simply lazy thinkers. Agree as I might with what you wrote, 9watts, there are still land use issues (and other economic realities) that would/will occur locally even if world population was decreasing. Even decreasing populations have transitory characteristics. Heck, US population is close enough to flat, and Portland’s growth isn’t driven primarily by immigration, so this is a pretty good example of just such an issue. Detroit would be another. Right. Like, you know, the inverse of Eric Lukens’ Oregonian. Ha! I’ll grant you that the U.S. population growth rate has declined a bunch of late, but the growth rate of the Portland-Vancouver MSA for 2012 and ’13 was nearly three times the US rate at 1.8%/yr = doubling time of 39 years. Sorry I wasn’t clear; by “isn’t driven primarily by immigration” I had in mind immigrants from other countries, not transients from within the US. In other words, I was taking the US as an isolated example of a stable/decreasing population and looking at change within that example. Sure, there are non-US immigrants in Portland, and of course there are births (and deaths, and movings away), but the primary cause of growth in Portland is other USAians moving within our isolated USA example. Expand that example to the world and even when the population curve peaks and turns down there will still be places where population increases (transitory populations). Those places will have land-use issues due to increasing population, different issues than places with decreasing population, and both sets of issues will occur in the face of total population decline. It is neither the increase nor decrease of the *total* which incurs those local issues; it is the local change. So, while I fully agree that human population is a big (ok, the biggest for humanity) issue and that discussion of that issue quite arguably does not get enough play on any stage from the world to the back yard, I’m not convinced that *that* discussion in any way trumps, precludes, overrides, replaces, or otherwise addresses the issues under discussion of Portland-specific growth. And I don’t think I was suggesting that. Rather I was imagining that problematizing growth (of population, but not just population) could usefully augment, deepen, & improve our debates about these land use issues. True, you didn’t actually say that. What you did say, though, was “The tenor here on bikeportland, and pretty much everywhere else, is that growth is a given, something we need to anticipate, plan for, accommodate, even reward.” So, “reward” is the special case, and I’ll leave it for individual readers to consider BikePortland’s editorial stance on that (I don’t see all that much “reward” here, but maybe some do). For the rest of it though, yes, I do think that anticipating, planning for and accommodating growth is a pretty smart thing to do, at least in cases where growth is occurring or is about to occur, just as I think that places where shrinking is happening should plan for and accommodate that force (like Detroit ten to twenty years back, and plenty of other US cities today). Maybe there’s some way to dampen that flux of humanity from one location to another, and maybe that’s what you’re getting at (and if so, please say more! ), but my read on human history from the Fertile Crescent through almost every major culture I’m aware of is that cities grow and collapse, then grow and collapse again in many cases, but they don’t stay constant for extended times. Yes. Change happens all the time. I am not opposed to change. What I am opposed to are the myriad ways in which we (and by we I mean not so much bikeportland, but our policies, politicians, tax structure, land use laws, urban growth boundaries, etc.) don’t just allow for growth, but reward it, encourage it, seek to have it happen here, and faster, than over there. Just like with some other subjects we bandy about here: high viz clothing, or bike lanes, the short term, pragmatic, thing may be to don special garb, or paint a few more bike lanes, just like planning for tomorrow’s anticipated influx of new residents may be wise. But in all of these cases what we see is that our representatives, elected officials, city staff, etc. fail to appreciate that these measures were or should have been a stop gap, that the real thing we should have been focusing on: enforcing speed limits, making driving harder (Roger Geller? ), discouraging the kinds of growth that cause more problems than they solve; in other words, the longer term policy, never happens. We never seem to get past the easy stuff. That is what frustrates me about all these logical sounding, but totally-inadequate-as-the-only-policy, measures. We are always planning for the next few years or decades of growth, but never stop to have the larger conversation about where this is all going, who benefits, and who loses, whether any of us actually want this state of affairs, or could imagine going about this a bit differently. I think there are probably dozens of ways. From the mundane to the exotic, from easy to difficult-to-imagine. Let’s start with some easy ones: Why have our houses become, above all else, investments, poker chips in the big real estate casino? Why don’t we have any policies that encourage people to stay put, to not sell their house. Flipped around, what if we taxed real estate transactions? Neighborhoods don’t thrive with high resident turnover; in fact if a large fraction thinks of their houses as investments, scheming when to sell to make the biggest profit, rather than where they hope to live the rest of their lives, it is much more difficult, in my experience, to inspire civic engagement. Rent control is another method for encouraging the rest to stay put. Why do city governments, politicians, and the economic interests that all too often influence them always fall over themselves to woo new businesses to town? Why don’t they instead take a look at the businesses that are already here? Might any of them benefit from a handout like what are always tossed at the newly arrived businesses? For some reason we don’t do maintenance very well. ODOT reflexively wants to build new highways but fails to maintain the ones we have. Same with our economic priorities. So many places we could start. You should give all of your stuff away…..unless you value it, of course. Sounds like it is time to rent my 1920’s Craftsman and buy a smaller place downtown. There’s nothing in the story about those missing homes. And then there’s you. 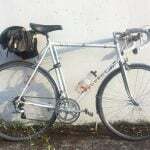 You post mopey, angry comments to a bike blog, excoriating just about everyone – for biking. has the price of rent gone down yet??? didn’t think so — what are you going to do when you are too old to work at killer burger?